Candidates can get the subject wise Maharashtra Forest Surveyor Previous Papers from this page. And with the help of these Maharashtra Forest Department (MFD) Forest Surveyor Previous Year Question Papers, you can easily score more marks in the MFD Examination 2019. 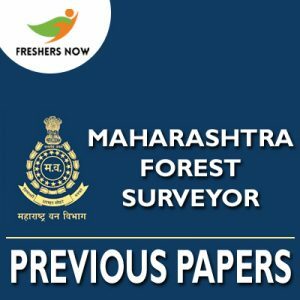 Also, you can get the latest Maharashtra Forest Surveyor Selection Process 2019 together with the Maharashtra Forest Surveyor Exam Pattern 2019. The महाराष्ट्र वन विभाग Forest Surveyor Examination will be conducted tentatively in the month of March 2019. Furthermore, you can download the mahapariksha.gov.in Old Question Papers in PDF format from the direct links given ton the end of this page. Candidates can directly check the rounds of the Maharashtra Forest Surveyor Selection Process 2019 which was assigned by the officials of the Maharashtra Forest Department (MFD). So, candidates need to check this section, to perform according to that. As per the latest update, they have clearly mentioned that those who qualify the written examination will only be promoted to the next rounds of the recruitment process. Well, our team had gathered all the useful information through the official notification from the MFD’s site. Therefore, those details are settled up in the below tabular form. So, candidates who are going to attempt the test need to stick on this section to note down the Maharashtra Forest Surveyor Exam Pattern 2019. Through this table, one can notify the topic names, the total marks awarded for the test. Additionally, you can also know the duration of the test. Do cover all the topics before the test or a week before. So that you can have more time to revise them again and again. Maharashtra Forest Department (MFD) has recently announced the Recruitment Notification to fill multiple positions of Forest Surveyor. Those, who want to apply and gain the Government Job need to apply for the Recruitment 2019 on or before the last date that is 14th February 2019. And also, the last date is so long. Therefore, all the interested ones who have not yet applied should come out and apply before the deadline. As the Written exams are rushing, many candidates started their preparation. So, candidates who are looking for mahapariksha.gov.in Old Question Papers can get them here with the help of this page. There is heavy competition for these Openings, as many people had a dream to work in MFD. Hereby we insist the aspirants start their preparation as early as possible to get qualified in an exam by using Maharashtra Forest Surveyor Previous Papers which we included further in this post. Below are the direct links that help you to download all the subject wise महाराष्ट्र वन विभाग Model Question Papers in PDF format. So, they not only contain the questions but also included with the suitable answers, solutions. Start your preparation by downloading these files. Moreover, for the ease of candidates, we have given them in PDF format that too for free of cost. More and more practicing the frequently asked questions gives you a good result in the examination. And now, start up your preparation with the help of the Maharashtra Forest Surveyor Previous Papers PDF’s. So, we hope that all the eligible candidates have gathered important information. Consequently, do follow us on our Freshers Now page to get all such updated news. You can even drop your comment in the below section of our page so that we will quickly respond to you.